The 2016 Livonia Avenue El-Space Challenge is a partnership between ioby and the New York City Department of Transportation (DOT) that’s connecting community leaders in Brownsville, Brooklyn with funding and support for their creative, short-term projects that reimagine the space around the elevated train structure (“el-space”) along the neighborhood’s Livonia Avenue. But that’s just one of Make Music Brownsville’s many joyful aims. Another is to celebrate the reopening of a youth-run farmers market on Rockaway and Livonia Avenues that was long ago shuttered to accommodate subway maintenance. Yet another is to get people out and enjoying Betsy Head Park and the neighborhood’s other public green spaces. 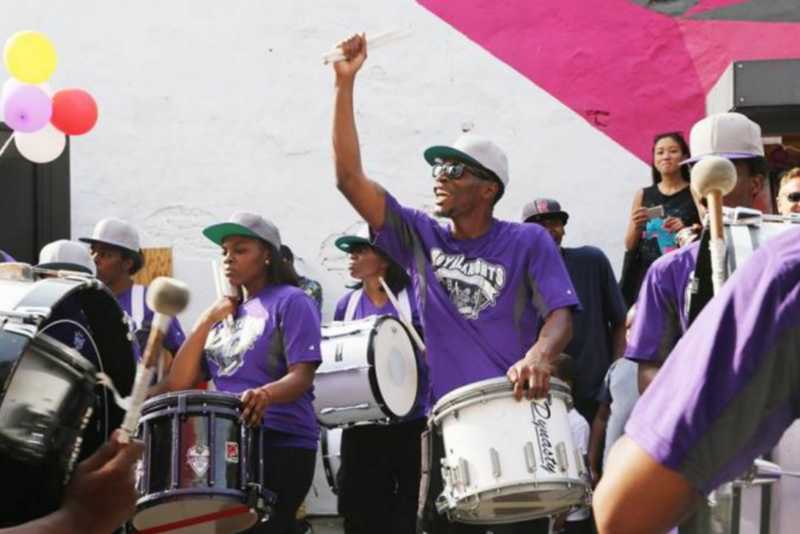 Perhaps most poignantly, Make Music Brownsville serves as a touching tribute to and manifestation of the lifelong work of Greg “Jocko” Jackson, a Brownsville native, former professional basketball player, and tireless community advocate. Last year, the Greg Jackson Center for Brownsville opened its doors on Rockaway Avenue. “He was really the unofficial mayor of Brownsville; you could turn to him for anything,” Layman says.